Students of the Academia awarded several prizes in important international competitions! 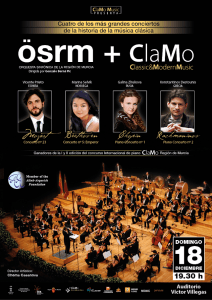 Students of the Academia will perform with Orquestra Sinfonica de Múrcia! Opens Vocal Department, led by the portuguese soprano Carla Caramujo! Application deadline for the Academic Year 2015/2016: 1st September! Ruben Micieli, Konstantinos Destounis, Galina Zhukova and Aldo Dotto prizewinners in I Concurso Internacional de Piano de Murcia! Pedro Afonso Ribeiro awarded 3rd prize in Concurso de Piano da Póvoa de Varzim.